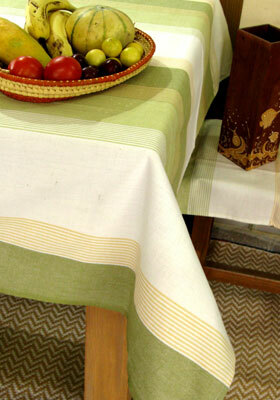 Bharat Mata Kusht Ashram (BMKA) has a brand new range of tablecloths now available in MESH shop, Uday Park, Delhi. 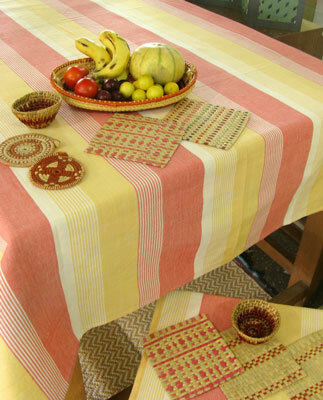 100% cotton hand woven they are suitable for a 6-8 seat dining table (150x230cm). Look for checks and stripes in four new colourways all designed in MESH Design Studio by Hrishi. The same colours and patterns feature in a new kitchen range to be launched soon. Bharat Mata Kusht Ashram is a leprosy colony in Faridabad near Delhi. The men and women dye the yarns in the colony, prepare the long warps and then weave the cloths in a large weaving workshop in the middle of the colony. BMKA products are sold by MESH from our shop in Uday Park, New Delhi and by export all around the world.